Both the 105mm Abbot and 130mm Catapult M-46 self-propelled howitzers are being phased out from active service due to age and mechanical problems. 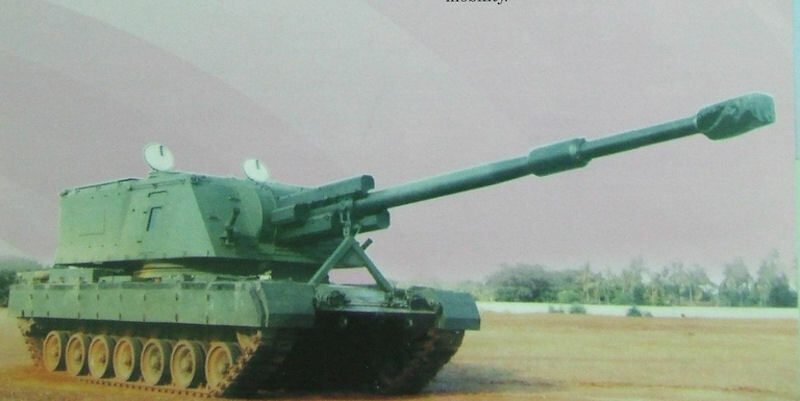 A self-propelled artillery competition -- pitting the Celsius (Bofors) FH-77AD against the Bhim SP System [with the Denel LIW T-6] -- was undertaken to replace these systems as part of its Field Artillery Rationalization Plan. The main advantages that the Celsius/Bofors FH-77AD offers over the Denel T-6 is that it is based on a proven and easy to maintain 6X6 Volvo truck chassis. Compared with full-tracked self-propelled artillery system, the 6x6 FH-77 BD would have a number of advantages, including greater strategic mobility and lower procurement and life-cycle costs. The T6 turret is self-contained and can be mounted on any other suitable vehicle platform and its development was finally completed in 2008 and offered for export. The new Denel T-6 vehicle is called the Bhim after a hero from Indian folklore (Bhima = Powerful). The turret has ammunition-loading hatches on the right and left, and a conveyor belt may be extended from either of these hatches for ammunition loading or direct feeding of the gun from a ground pile. There are two hatches on the roof of the turret. The vehicle is equipped with GPS and a fire control computer for direct laying of the gun, or firing at a target where the location is known. It consists of the fully autonomous T6 turret equipped with 155mm 52 calibre armament that can fire to a maximum range of 42 km mated with derivative MBT Arjun Chassis. The projectiles are of the extended range full bore type (ERFB) and provide increased range and terminal effectiveness compared to other 155 mm systems. Accuracy is exceptional. At 75% of maximum range, the probable error specification is only 0.48% of range and 1 mil in deflection. The vehicle is equipped with 1400 hp power pack and the state of the art hydro-gas suspension. The high mobility and exceptional ballistics together with the comprehensive sub-systems make BHIM T6 one of the finest 155 mm Self –Propelled guns available today. The salient features of this equipment are a fully autonomous T6 turret mated with high mobility chassis system, Extended Range Full Bore (ERFB) type projectiles, Modular charges, High Accuracy, Long range, High rate of fire, Multiple Round Simultaneous Impact (MRSI), Muzzle velocity-measuring radar, Gun barrel cooling, Barrel retraction, Rapid deployment and quick displacement, Fully automatic laying and navigation, Fully automatic ammunition loading, Replenishing while firing is in progress, Sight for direct firing, Power and manual backup, Automatic Fire detection / extinguishing, 81 mm stroke grenade launchers, Escape hatch provision, High power to weight ratio, Hydro-gas suspension, Excellent ride comfort, Superior strategic and tactical mobility, Transportable by train. The Bhim system had achieved a sustained rate of fire of 116 rounds at a desert firing range in Pokhran in western India. The cost of procuring 520 such howitzers eventually is estimated at $972 million. The Arjun tank chassis to be used by the Bhim with the Denel T-6 turret, in contrast, has yet to enter full service. The MoD had approved building 120 Arjuns, but with arrival of the Russian T-90 main battle tank, the Arjun chassis could be diverted to Bhim. The Bhim was favored to win the Indian SP Howitzer competition, primarily due to the potential for domestic production. However, the first examples were thought likely not see military service until at least 2004. In April 1987, following media disclosures in Sweden about the illegal payoffs, the GoI in 1989 indefinitely suspends all commercial contacts with Bofors AB. The Bofors scandal was a major political scandal that occurred between Sweden and India during the 1980s and 1990s, initiated by Indian National Congress (Congress party) politicians and implicating the Indian prime minister, Rajiv Gandhi, and several other members of the Swedish and Indian governments. In 1996, Russia's Rosoboronexport State Corp and Ekaterinberg-based Uraltransmash proposed to co-develop with the DRDO and OFB a hybrid 2S19M1/MSTA-S tracked SPH that combines the hull of the T-90S MBT with a turret containing a 155mm/52-cal barrel that is jointly developed by Bofors AB and Volgograd-based Barrikady State Production Association. The MoD and Army HQ ignored this offer. As of January 2005 Rs 2,000 crore deal for 100 such guns was expected to be signed soon. A contract for 120 tracked and 180 wheeled self-propelled (SP) 155mm guns was about to be concluded after years of repeated trials. But in 2005 the United Progressive Alliance (UPA) government cancelled an order for 400 anti-material rifles from South African manufacturer Denel, charging the firm with paying bribes. As a result, the deal with Denel to collaborate in establishing an ordinance factory at Nalanda in Bihar was also cancelled. The defence ministry also terminated the limited series production of an indigenous version of a self-propelled howitzer called Bhim, even though Bharat Earth Movers Ltd in Bangalore had set up production facilities at considerable expense. The Denel 155mm/52caliber towed howitzer the Indian Army was evaluating againat two other guns was dropped from consideration. In 2005, after Denel’s T6 turret was chosen to be the weapon mated to an Arjun chassis, the South African gun maker was blacklisted by the Indian government following allegations of using influence to swing a separate deal. In April 2005, the MoD suspended work on the project to acquire 180 G-6 wheeled SPHs and 54 Bhim tracked SPHs following publication by the South African newspaper Cape Argus of a report claiming that the Denel/Mechem, after winning a contract to supply 100 NTW-20 anti-material rifles and related ammunition to the Army, paid 12.75% of the contract value ($393,720) as commissions on December 8, 2002 to Isle of Man-based Varas Associates, which had reportedly influenced the MoDâ€™s decision to choose Denel/Mechem as the preferred supplier of the rifles. BHIM Project had cleared all Indian Army user trials before South African state-owned Company Denel was blacklisted amid corruption charges which had co-developed BHIM with DRDO and had also provided its 155mm/L52 howitzer Gun for the project. In 2007, DRDO’s effort to identify a new gun for the Bhim had ended in a single-vendor situation, with only the Samsung Techwin coming forward to bid with the K9 turret. In 2011, the DRDO revealed in the latest edition of its Tech Focus journal that “the system has been successfully evaluated and accepted by the user”. By 1995, Army HQ reformulated its Field Artillery Rationalisation Plan (FARP), under which it planned to replace its 14 different medium artillery howitzers (towed and self-propelled) with 155mm/52-cal towed, motorised and tracked howitzers for the majority of its Artillery Regiments by 2025. Army HQ also said that over the 9th (1997-2002), 10th (2002-2007), 11th (2007-2012) and 12th (2012-2017) Five Year Plans, it sought 400 additional tracked and motorised SPHs. The Indian army had a requirement of 400 mounted 155-mm / L52 howitzer. Out of these 400 howitzers, half could be based on Arjun chassis and another 200 to be mounted on modified TATRA trucks. Of course, this being India, by 2017 none of this had happened. After been in Cold Storage for more than a decade, by early 2016 DRDO planned to revive 155m 52 Calibre Self-Propelled Artillery Gun mounted on Arjun MBT derivative chassis. 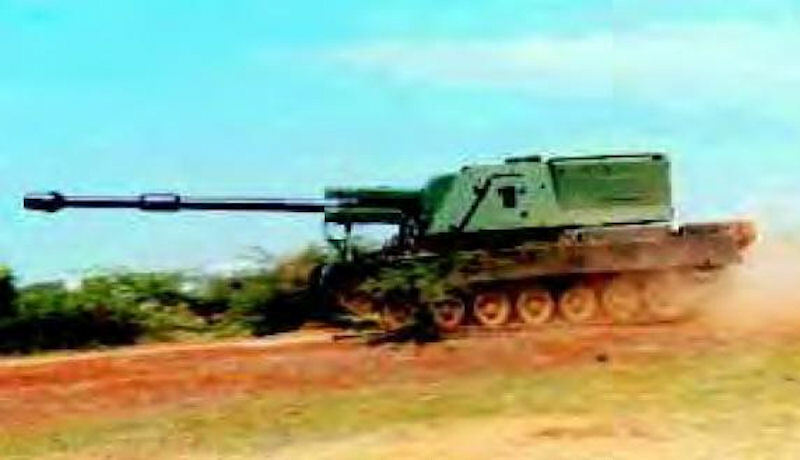 DRDO might source the new Gun either from Kalyani or use modified derivative Gun from in-house Advanced Towed Artillery Gun System (ATAGS) project developed with partnership with Kalyani and TATA. The vehicle is equipped with 1400 hp power pack and state-of-the-art hydro-gas suspension. BHIM was appreciated by Indian Army for its High mobility and exceptional ballistics coming together with comprehensive subsystems making BHIM one of the finest 155mm 52 Calibre Self-Propelled Artillery Gun which was one step from entering Production. Indian Army, due to uncertainty in ‘Bhim’ howitzer project, went for International tender. Since the need for self-propelled howitzers had been dire, India once again floated an RFP in the aftermath of the Denel fiasco but was left with a single vendor proposal by Samsung Techwin. Hence, a new RFP was issued and apparently, SWS Bofors, Nextel, Samsung Techwin along with Soltham responded to DRDO for the replacement gun. By 2016 the Army was in the process to place orders for K9 Vajra-T, the 155-mm/52-caliber self-propelled howitzer artillery gun co-developed by Larsen & Toubro (L&T) and Samsung Techwin. Indian Army planned to procure 100 K9 Vajra-T likely to be followed up with the purchase of additional 50 more K9 Vajra-T at a later stage. But Army requirement might be for over 500 such howitzer artillery gun which might have prompted DRDO to bring the focus back to BHIM Project.